Gaining the edge in today’s competitive market requires intelligence derived from data and the ability to act upon information to improve processes and machine performance. If two companies have the same equipment, what then becomes their competitive differentiation? It first starts with the people they employ, their skill level and in their desire for continuous improvement. Next are the processes that company has developed over time and that have made them successful, followed by the quality of their end products and their ability to deliver. OEE provides the metric for managers to see the true performance of their machines and where there are areas for improvement. While job tracking software provides information on jobs as they move from one machine to the next, the finite data on the performance of the machine requires information from each machine and analyzed by performance metrics such as OEE Calculations (Overall Equipment Effectiveness). Within the OEE analysis, is the metric of machine “Availability.” Availability is calculated by (Run Time/Planned Production Time). Run Time is planned production time minus stop times, where the production was stopped due to unplanned down time or other process stops initiated by the operator. Another metric of OEE is machine “Performance.” Performance is calculated by ((Total Part Count/Total Run time)/Ideal Run Rate)) Ideal run rate is the quickest time a single part can be run. Performance takes into account anything that causes the manufacturing process to operate at less than the maximum possible speed. The last metric of the OEE calculation is “Quality”. Quality is calculated (Good Parts/Total Parts). The OEE calculation effectively takes into account all losses resulting in an accurate picture of your production manufacturing time; OEE = Availability x Performance x Quality. Using Data To Your Advantage: You can’t improve what you don’t measure. Modern CNC equipment has the ability to provide real-time data that can be used not only by automated systems but also by Smart Manufacturing software systems that provide real time intelligence for manufacturers to continuously improve their processes to gain the competitive edge. Data intelligence is providing the information necessary for manufacturers to remain efficient and profitable and also maintain quality and delivery schedules. 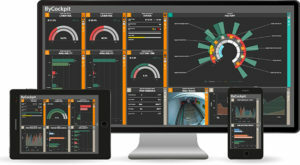 Bystronic’s new ByCockpit application enables users to visualize the OEE metric and see in detail the Availability, Performance and Quality measurements that drive continuous improvement efforts in the manufacturing process.